the training for civil servants, health workers, social workers, journalists and other professionals. It is a means of understanding the scale and quality of such practices and identifying gaps and areas for improvement. 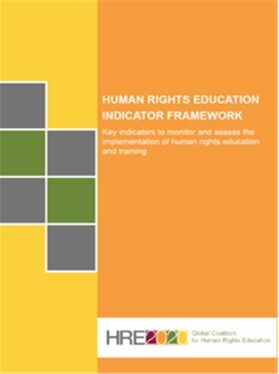 The Human Rights Education Indicator Framework is intended to be an inspiration and guide for the review of human rights education within a range of policy and practices. It has a clear, user-friendly structure of key questions, indicators and sub-indicators to provide a comprehensive picture of the status of implementation of human rights education at national level. Only some portions of the framework may be relevant for a particular context. The full document, along with the individual sections, is available for download in the right column on this page. Please refer to the "Introduction" for more details on how to utilize the Framework.